A place for Architectural Record readers and thought leaders of the profession to weigh in on news, projects, and trends. Architectural Record presents brief interviews with top newsmakers from the architecture world. From leading architects and designers, to noteworthy clients and policy makers, RECORD is constantly in conversation with the people shaping the profession. Architectural Record editors and critics review the latest books, films, and exhibitions about architecture and design. The AIA recognizes that continuing education in architecture is crucial to advancing and improving the profession. Earn AIA Continuing Education learning units by reading these articles and their supplemental materials, then taking a quiz. A regular feature focusing on up-and-coming architects and firms, from Architectural Record. Architects and designers recommend the top spots to eat, drink, stay, and see in their own cities. Each of the six jurors rated this year’s 425 entries according to usefulness, aesthetics, and degree of innovation. The winners and their flashes of genius are showcased on the following pages. A jury of three architects, two lighting designers, and one interiors director selected the best new products of the year, choosing from the hundreds of entries submitted to Architectural Record’s annual competition. Jurors rated each hopeful according to innovation, usefulness, and aesthetics. We showcase the winners and their flashes of genius on the following pages. For the 2014 Record Products, a jury of six professionals selected the best new products of the year from among 500 entries submitted for architectural record's annual competition. ARCHITECTURAL RECORD's editors put out a call for manufacturers to send us the best new building products on the market-from furniture to flashing-and invite a jury of architects, designers, and product specialists to review product data sheets, photos, and sometimes real samples, to help us determine which are the most outstanding. 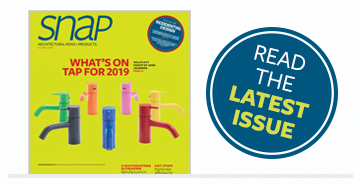 Record Products presents a comprehensive look at some of 2011’s more remarkable building-product offerings selected by a discerning jury of your peers. Record Products presents a comprehensive look at some of 2008’s more remarkable building-product offerings selected by a discerning jury of your peers. Architectural Record’s 35th Annual Product Reports presents more than 300 of 2007's most innovative new Building products selected by a jury of architects and designers. Architectural Record’s monthly feature takes an in-depth look at one particularly well-designed home. Now in its sixth year, RECORD's Cocktail Napkin Sketch Contest demonstrates there is still a passion for drawing within the architecture profession. 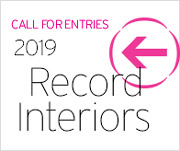 RECORD received submissions that represent a wide range of architectural experience and background, from college students to long-practicing professionals. The nine winners, including a firm, were selected after a thorough evaluation process. Now in its fifth year, RECORD's Cocktail Napkin Sketch Contest demonstrates there is still a passion for drawing within the architecture profession. RECORD received submissions that represent a wide range of architectural experience and background, from college students to long-practicing professionals. The nine winners, including a firm, were selected after a thorough evaluation process. For the fourth year of its Cocktail Napkin Sketch Contest, RECORD was again flooded with hundreds of reader entries. Contestants represented firms from coast to coast and from a variety of occupations within the field of architecture, including principals, designers, students, and interns. The competition was stiff and our staff jury pored over every drawing to handpick the top designs. If you are a licensed architect or related professional who practices in the United States, you can enter this remarkable contest. All you need is a white cocktail napkin and pen to demonstrate that the art of the sketch is still alive. 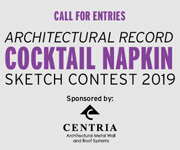 Two grand prize winning submissions will be published in the September issue of Architectural Record and winners will receive a box of napkins with their sketch printed on it. Winners and finalists will be seen in our online Cocktail Napkin Sketch Gallery. Because of the enthusiastic response to the cocktail napkin sketch contest initiated a year ago, RECORD decided to do it again—not so much to encourage downing martinis as to honor the impulse to draw in a digital age. This year the jury of editors evaluated more than 1,200 napkins from nearly 400 entrants. With so many submissions, RECORD decided to select winners according two categories— professional architects and nonprofessionals (architectural students, designers, and others). After being deluged with 1,322 cocktail napkins bearing sketches from 352 architects and architecture students, Architectural Record's jury of editors has determined the winner of its first annual Cocktail Napkin Sketch Contest. Explore the components and systems professionals leverage in today's better built environments.